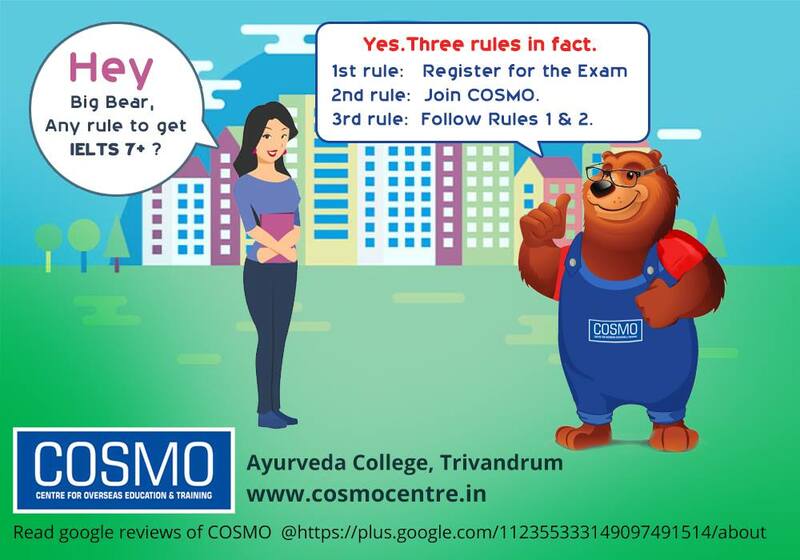 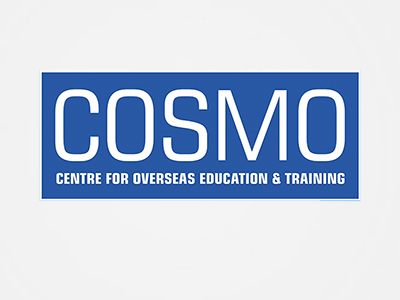 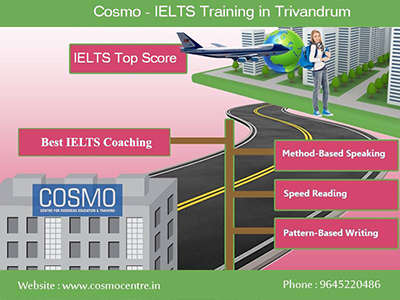 COSMO Center Trivandrum has gained a reputation of being the best IELTS training institute and coaching centre in Trivandrum, Kerala. We have made IELTS Trivandrum examination as simple as a piece of cake. 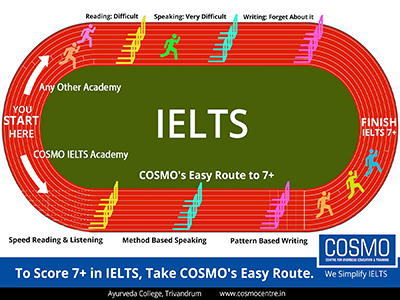 We are set apart from the rest of the IELTS coaching centres in Trivandrum in the way we approach all things deemed complex, be it Speaking, Writing, Reading or Listening. 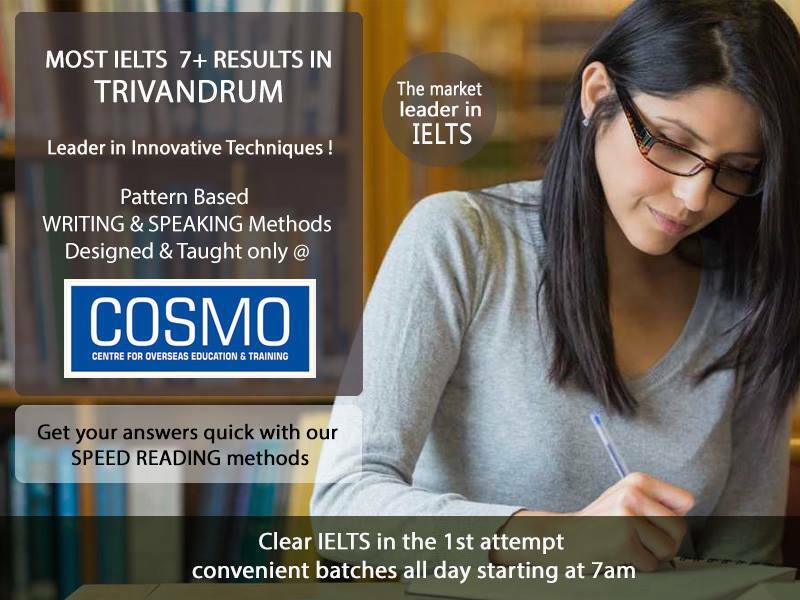 Hence it’s no surprise that the enviable distinction of having the most number of IELTS 7+ results in Trivandrum, Kerala and India has been achieved by COSMO IELTS coaching Centre in Trivandrum for the last many years. 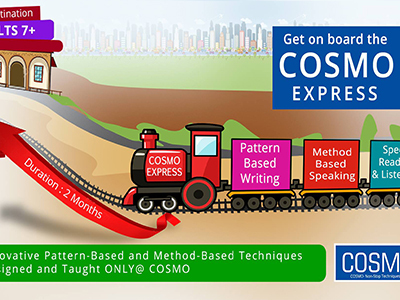 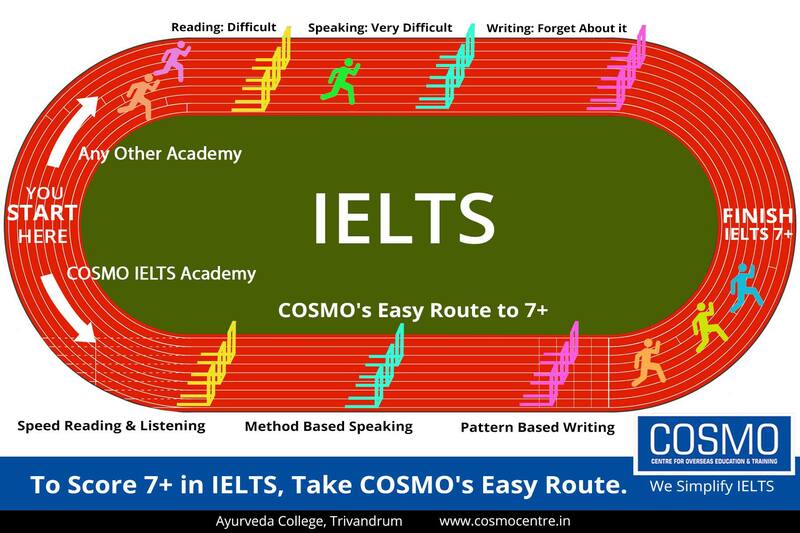 If you are looking for the finest IELTS training in Trivandrum, then you have hit the bull's-eye with COSMO IELTS Preparation centre as we are the ONLY IELTS academy in India to teach Pattern based Writing and Method based Speaking techniques that makes IELTS Preparation Course in Trivandrum very simple for even non-English medium students. 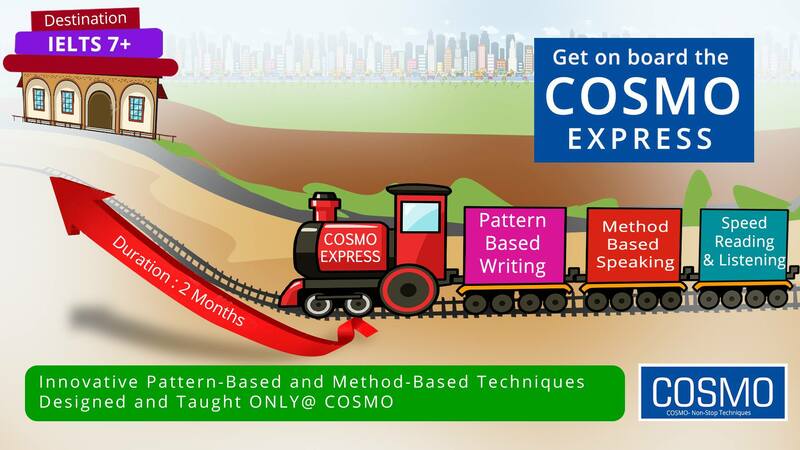 We deconstruct complexity and provide it to you in a way you never thought possible. 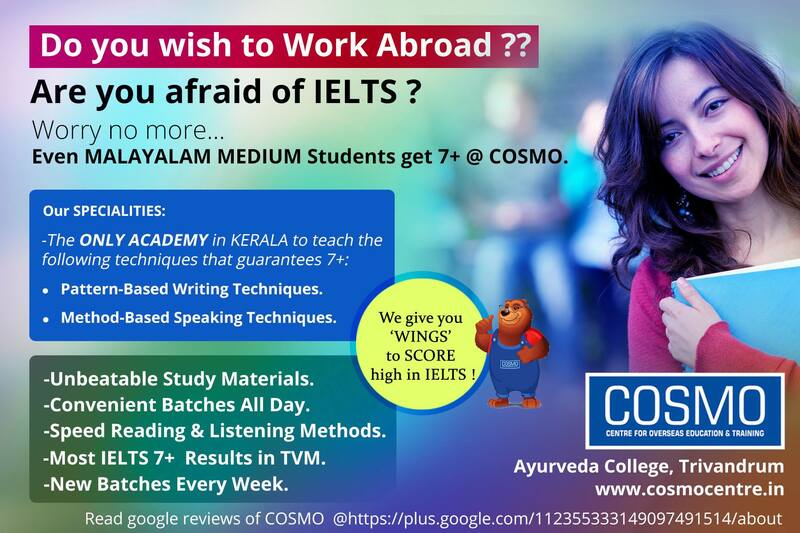 As a tribute to our efficacy, many IELTS Institutions in Trivandrum city and Kerala, India have employed faculty members who got trained by us. 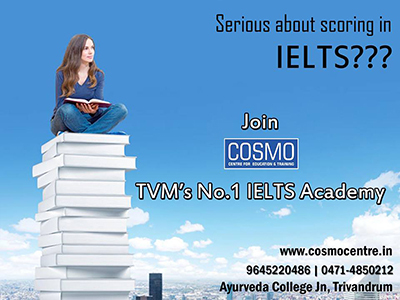 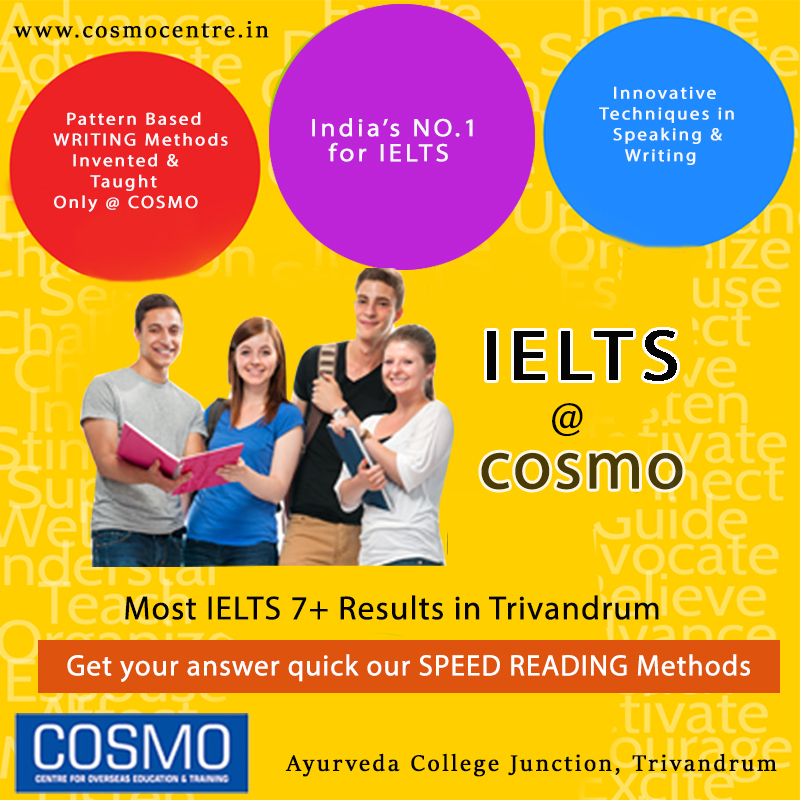 It is no coincidence that IELTS students from all over Kerala and India hail COSMO IELTS Trivandrum as the best IELTS coaching centre in Kerala & India for the techniques that we teach. 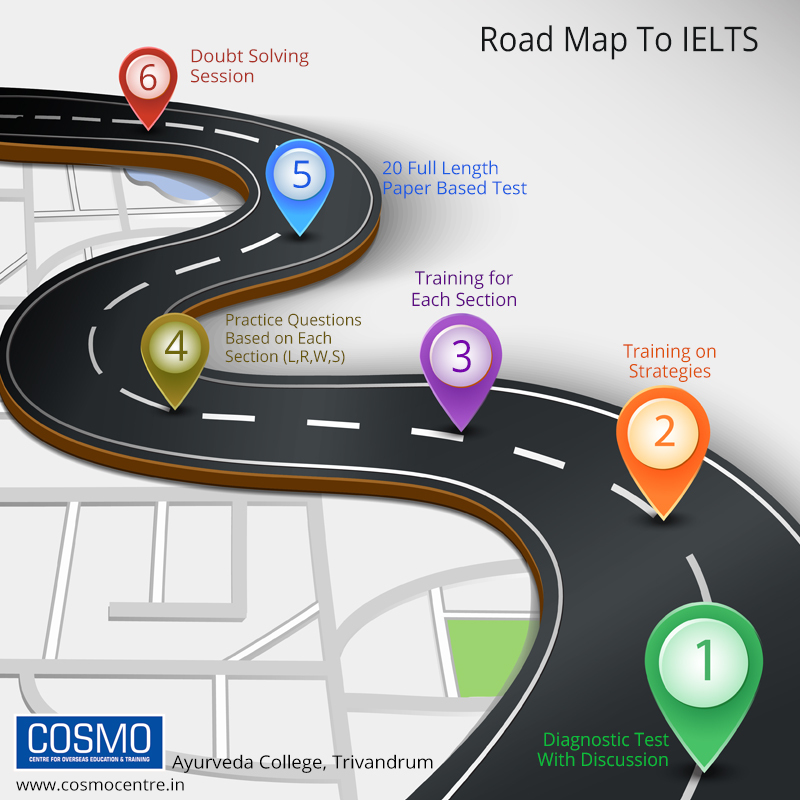 Not every IELTS training centre in Trivandrum or Kerala has the wherewithal to teach you the tricks and techniques that you require to crack IELTS in Trivandrum. A liberal dose of creativity and profound knowledge of the language is essential to manipulate the system to your advantage and we supply that in a nutshell to our IELTS Trivandrum students. 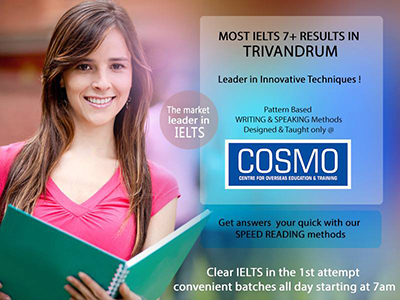 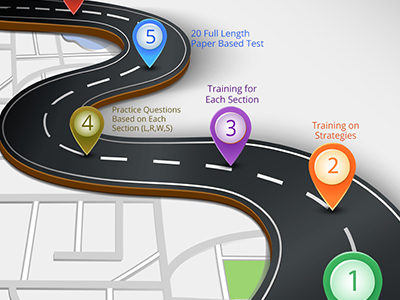 Consequently, IELTS test in Kerala is made simple for you, whatever your time-frame is. 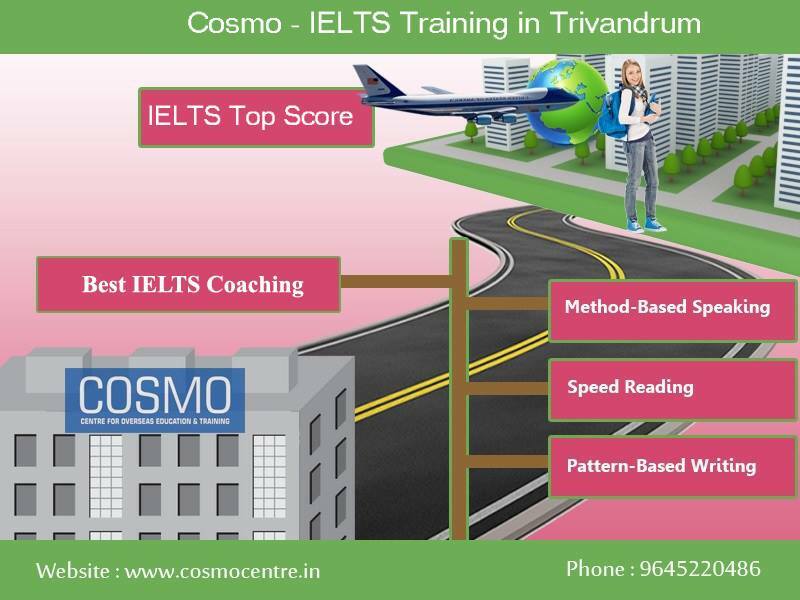 It is not uncommon to find students from different parts of Kerala choose COSMO IELTS in Trivandrum as their preferred IELTS training centre not just for the amazing style of teaching but also the wide range of IELTS materials and notes that is impossible to get in any other training centre across Kerala. 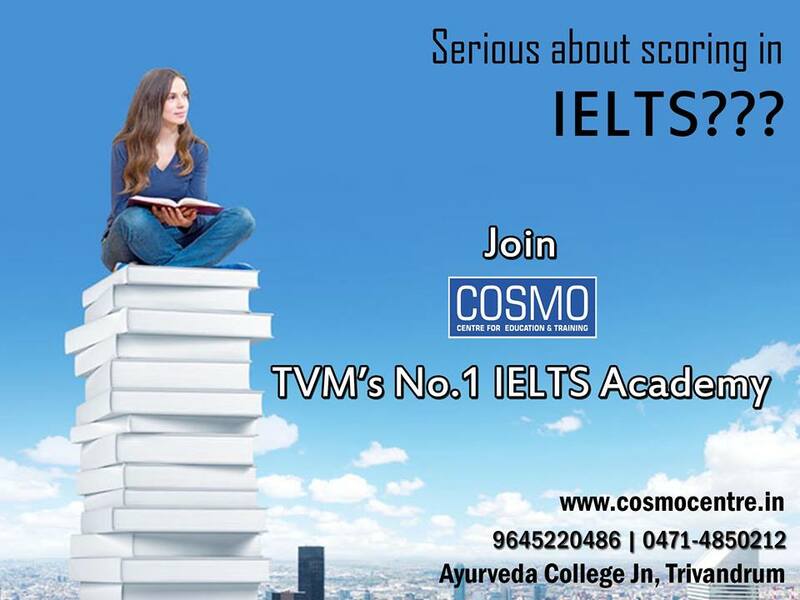 If you are after the best IELTS coaching institute in Kerala (India), then you can’t go wrong, if you choose COSMO IELTS coaching Academy, Trivandrum, Kerala. 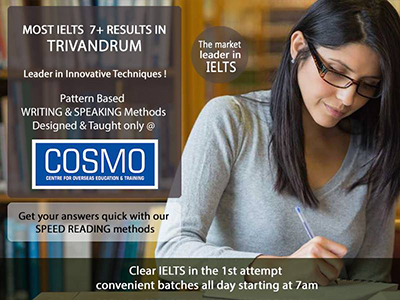 We are hailed as the most favourite IELTS training center in Trivandrum by students and trainers alike for the simple fact that we believe simplification of IELTS coaching in Trivandrum is a must, so that even weak students could confidently straddle the test and the better ones could achieve a perfect score with élan. 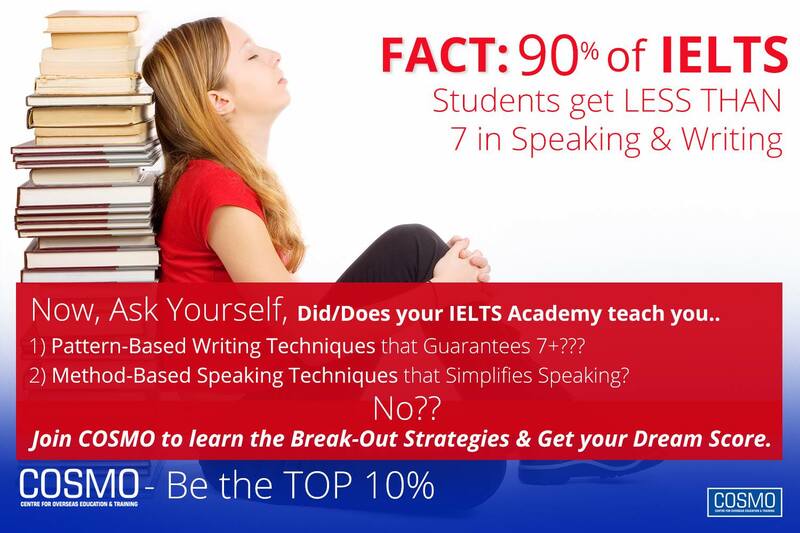 With the right attitude, we can put you on course to a great IELTS 7+ score and hence a happy life thereafter. 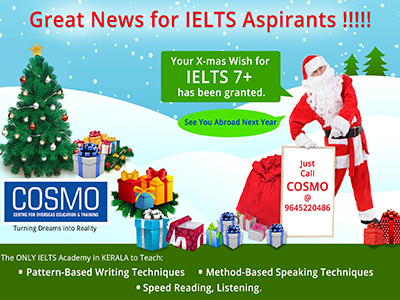 In a time when even travel agents in Kerala couch themselves as IELTS trainers, finding the best IELTS training centre in Trivandrum is like a job half-done. 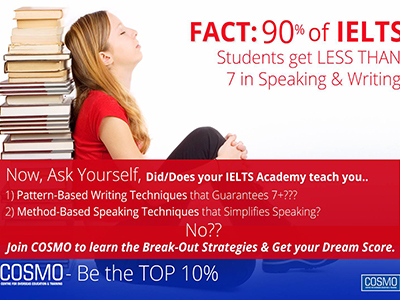 Hence, half your effort to score a high band of 7+ in IELTS should be invested in zeroing in on the right coaching centre/academy to train. 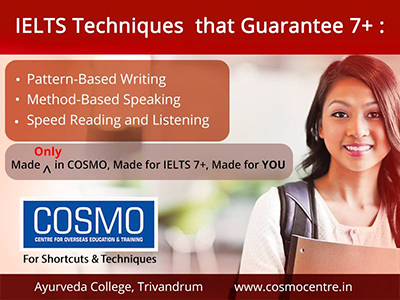 We at COSMO IELTS Centre in Trivandrum, train you to take on the mighty IELTS Goliath confidently, with our simple but effective techniques, just like the Biblical David had his. 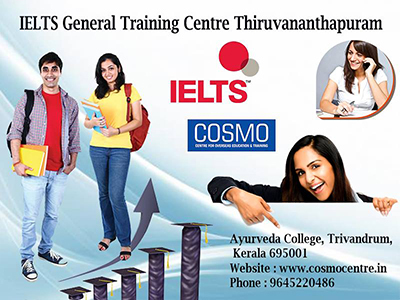 We offer IELTS class timings in Trivandrum ( regular & online IELTS training) which is most convenient for nurses who are working in different hospitals across Trivandrum, Kerala and Gulf countries like Kuwait, UAE, Saudi Arabia & Qatar. 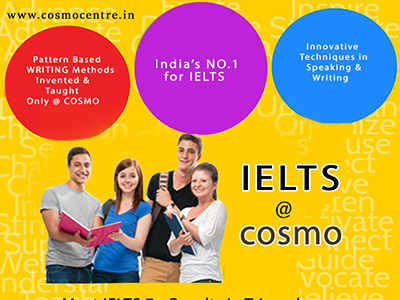 We also help students with IELTS Exam registration and get them the best possible IELTS exam dates from British council or IDP. 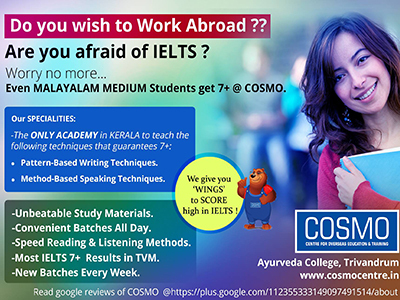 There are 5 IELTS exam centres in Kerala for British council viz, Trivandrum, Kottayam, Kochi, Thrissur and Calicut. 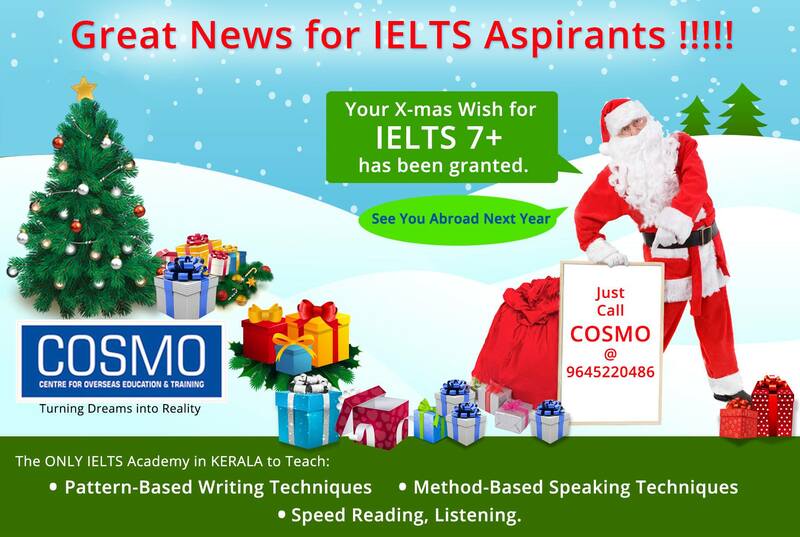 IDP has IELTS exam centres in Trivandrum, Kollam, Kottayam, Thrissur and Calicut. 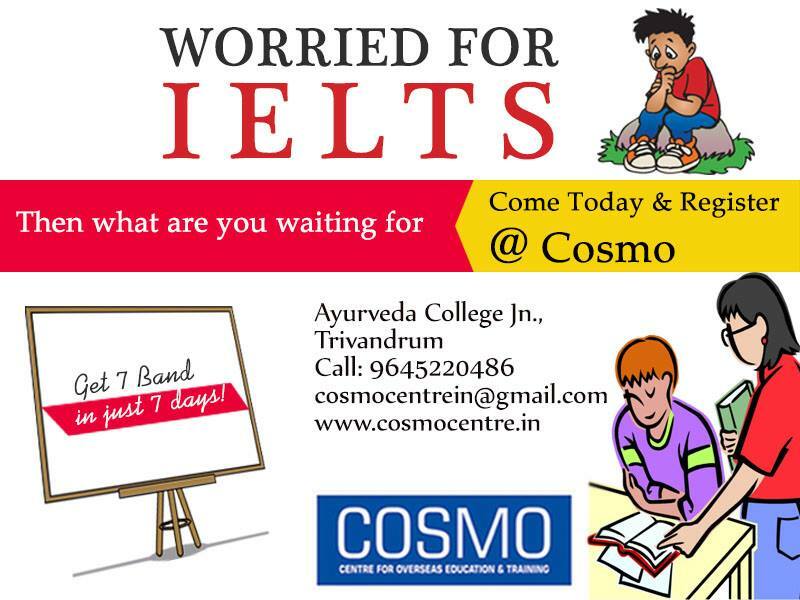 To know more about the IELTS Exam Fee / Test Dates in Trivandrum or about the IELTS Course fee in Trivandrum ( Classroom regular & Online IELTS coaching) , please contact our office @ 0471-4850212.